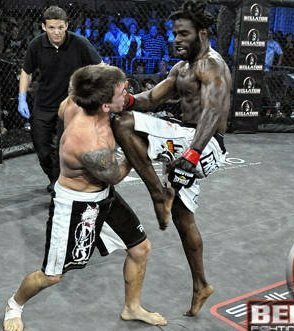 Daniel Straus made his pro debut at XFO 27 back in February of 2009. He’s fought in the XFO a total of six times, his last bout a win against the always tough Joe Pearson. Straus has been rolling since his KO-loss to Pat Curran at XFO 29. Since that fight Straus had won 10 in a row, including victories over solid opponents like Chad Hinton, Karen Darabedyan and Gideon Ray. He was invited to take place in Bellator’s season 4 Featherweight tournament. His first match was Saturday night at Bellator 37, and Straus pulled out a decision victory against previously undefeated Nazareno Malegarie. Straus was caught in several different sub attempts but was able to break free and out-point Malegarie. With the win Straus earned his way to the semifinals of the tourney.